If we follow the general rule that the length of a consolidation zone is generally mirrored by an equivalent move in price, then the target range is 1.078 for XLMUSD. 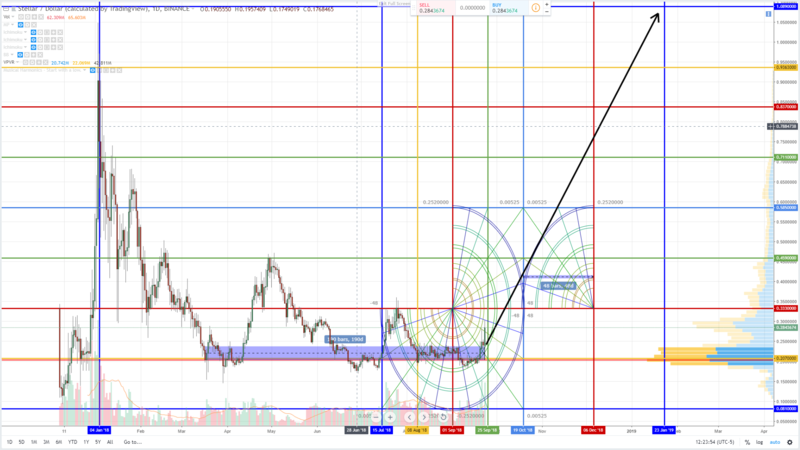 As for the time frame that it could reach, the longest time period should expect the move to take is until Jan 19th, which is the end of the current time cycle. However, given FinAstro cycles, the seasonal bull cycle and behavior of the market over the past 10 years, a move to and beyond 1.078 before January should be more expected – in fact, if XLM has not reached the 0.97 value area before December, then a move to the target is very unlikely – XLM (and the entire cryptomarket) is a victim and a beneficiary of the entire aggregate markets performance – there is still too much correlation in the market to assume that any single crypto will have a sustained move that deviates from Bitcoin.